The Iowa Hawkeyes will leave for the Outback Bowl on Wednesday and will play 18th ranked Mississippi State on New Year’s Day. 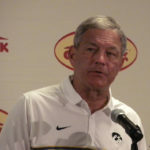 That is fewer days in Tampa than their last visit after the 2016 season and coach Kirk Ferentz says one of the reasons is there new indoor facility. After a few days off the players returned to Iowa City on Saturday night.